The end of summer doesn’t mean the end of river recreation in the Old Northwest Territory. From Janesville, Wis., to Rock Falls, Ill., the nearly 100 miles of Rock River shoreline offer endless possibilities. 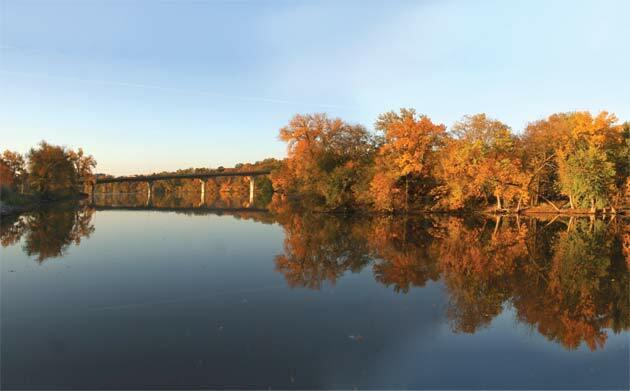 Follow the river on scenic drives and find the splendor of fall foliage, the convenience of amenity-filled public spaces, and the seasonal charm of the communities that thrive along its banks. Great scenery is a given on historic U.S. Route 51, designated an All-American Road and even celebrated in folk song. It runs north-south through six states, covering almost 1,300 miles, from just 100 feet shy of Michigan, near Hurley, Wis., all the way to the south edge of Lake Pontchartrain in LaPlace, La. In our Old Northwest Territory, Hwy. 51 runs along the east side of the Rock River in Janesville, a community with nearly 2,000 acres of parks, 200 directly on the river. While in Janesville, visitors may want to test their navigational skills in either the six- or nine-acre corn maze at Skelly’s Farm Market. Open daily through Halloween, the market also sells pumpkins, corn shocks, apples, cider and doughnuts. On Saturdays through the end of October, the Janesville Farmers Market sets up on Main Street from 8 a.m.-1 p.m. Follow Main Street around the bend of the river to Delavan Drive and South River Road, to stay within view of the water. Back on Hwy. 51, you’ll soon meet the Rock River again, in Beloit, where the road becomes Riverside Drive. This city celebrated its 175th anniversary in September, and among the many special events was a three-day festival on the banks of the Rock River in Preservation Park, on South Riverside Drive. The park’s shade trees provide a colorful canopy for autumn visitors. “Then, farther down Hwy. 51 [Riverside Drive], look right, and you’ll see Big Hill Park, with all its stunning colors,” says Vicki Stone, director of marketing and tourism sales at Visit Beloit. Located at Afton and Big Hill roads, its 197 acres are home to large numbers of oak and sugar maple trees. One its most distinctive features is a 90-foot bluff, once used as a ski jump and now providing panoramic views of the Rock River. Leaf gazers may want to stop at Riverside Park, 24 acres on the river, with shelters and restrooms, a lagoon, riverwalk and playground equipment. Between Portland and Henry avenues, restoration has transformed this section of Hwy. 51 into a picturesque boulevard with old-fashioned lighting. For other side trips around Beloit, Stone suggests Apple Hut or Ridgewood Orchard, for apples, cider and family fun; Beckman Mill, a 50-acre park with a restored grist mill and other 19th-century attractions; and the Beloit Farmers Market, held each Saturday from 8 a.m.-1 p.m. through Oct. 29. Leaving Beloit and crossing into Illinois, Hwy. 51 merges with Interstate 39 heading south. The route to the river in Rockford is North 2nd Street, or Hwy. 251. “Fall is one of my favorite seasons because of all of the changes,” says John Groh, president and CEO, Rockford Area Convention & Visitors Bureau. 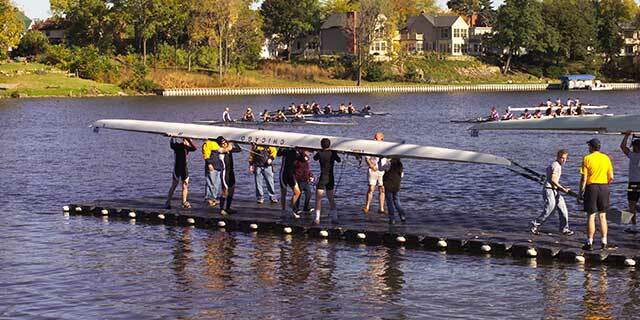 “There are a variety of places in the Rockford area to view beautiful fall scenery along the river. Shorewood Park [in Loves Park] and Sportscore One have boat ramps, and seeing the foliage from the river offers a great, unique view. Groh encourages folks to check out the Winnebago County Forest Preserve District sites on the Rock River. Atwood Homestead, Hononegah and Macktown forest preserves all have boat ramps, shelters and hiking trails. While you take in the fall scenery, Groh also suggests stopping at one of the many apple orchards and pumpkin patches in the area. At the outskirts of Chicago Rockford International Airport, South Main becomes Route 2, following every bend of the meandering river on its way to Byron. Between Byron and Oregon, Route 2 is closed for renovation. The detour takes travelers across the bridge to River Road on the south side of the river. Here, River Park, maintained by the Byron Forest Preserve District, has 1 mile of city’s 7-mile bike path running right next to the river. Across the road is the district’s Jarrett Prairie Center, with interpretive exhibits, and the Heritage Farm Museum, a restored 1847 farm. Visitors might want to stop in at both spots before continuing on. “River Road has places to pull off and see some beautiful scenery, and it takes you right past Lowden State Park as you come into Oregon,” says Bausman. Here, among the 100-year-old oak, hickory and maple trees, is the site of the Blackhawk Statue, offering views some 90 feet above the Rock River. Oregon has a vibrant art culture, with art galleries and three working foundries. Its “Sculpture Trail” takes visitors on a self-guided tour of seven public sculptures, created by both national and local artists, starting with Blackhawk, Laredo Taft’s Indian statue. The drive along Route 2 between Oregon and Dixon offers ample picnic and viewing opportunities. A winding tunnel of trees signals your arrival at Castle Rock State Park, with parking, a canoe launch and picnic tables. Climb a stairway to the summit of the spot’s namesake for amazing views of the river and its forests. Just outside Dixon is Grand Detour, marking a big horseshoe bend in the river, or “grand detour.” Here is the John Deere Historic site, with the home the famous plowman built himself, his original (still working) blacksmith shop, and tons of color from the property’s abundant sugar maples. Once in Dixon, follow Route 2 along the river to reach the new Heritage Crossing Riverfront. Completed in August 2010, the $4.5 million project transformed the space between the city’s two bridges into a downtown centerpiece. “The Riverfront is a great place to enjoy the river,” says Colleen Brechon, Dixon Tourism president. “You can take a picnic and eat at one of the umbrella tables, fish or just sit down near the water on the steps.” A life-size bronze statue of Ronald Reagan depicts Dixon’s favorite son, astride a horse and looking in the direction of his boyhood home. Visitors can follow that gaze down Hennepin Avenue, to visit Reagan’s old high school and his restored boyhood home. Across the river, just a few miles north, is Lowell Park, 200 forested acres on the Rock with handicap-accessible boat launches. A scenic boat trip will provide views of forests, steep limestone formations, farmland and houses, upriver all the way to Oregon’s dam, or downriver to Dixon’s dam. In the park, hiking trails and paved roads wind through the hilly woods, with some stops offering breathtaking vistas of the river valley. Back in town, between the bridges on this side of the river, is the only known statue depicting Abraham Lincoln in military dress. Amid a cluster of tall oak trees, it marks the spot where Lincoln camped during the Black Hawk War. On the other side of Peoria Avenue, Page Drive follows the river past the high school, through a canopy of old-growth oak and maple trees in Page Park. Its 45 acres offer ample river access, a boat launch, hiking trails, picnic tables and more. Page Drive ends at Palmyra Avenue, aka Route 2. Take a left to head down the road to Sterling. The Rock River flows through the heart of downtown Sterling, controlled by two dams only about a mile apart. Sinnissippi Park is 100 acres overlooking the river on Sinnissippi Road, with old-growth trees, picnic areas, shelters and playground equipment. Here, too, are boat docks and fishing access, both to the river and the Sinnissippi Bayou; two miles of paved walking trails allow visitors to observe the bayou’s abundant wildlife and colorful foliage. The Sinnissippi Mounds, a prehistoric burial site, is also here. Oppold Marina, 532 Stouffer Road, approximately 30 acres, has a boat launch, fishing, docks with gas pumps and a small store. Picnic areas, shelters, restrooms and playground equipment make it a family-friendly spot on the Rock in any season. Just below the lower dam is Lawrence Park, 25 acres on an island divided by Avenue G, with ample access to the bank and quite a few old-growth trees. On the upper Sinnissippi Dam, a walkway allows pedestrians to cross the river from Sterling to Rock Falls, on the opposite bank. This city of around 9,000 is gaining ground in its efforts to reclaim its river access. A feeder from the Rock River, the canal originates in Rock Falls and runs nearly 105 miles through five counties. In Rock Falls, residents and visitors can enjoy a section of those miles, with historic markers and fact signs, fishing and canoe access, and a partially paved trail along the canal, lined with oak and hickory trees. Centennial Park, 50 acres on 11th Street, offers another view of the canal. “Centennial Park has oak-lined trails where you’ll see beautiful colors, access to the canal for fishing, and two footbridges connecting it to Hennepin Canal State Park,” says Brunner. While in town, visitors may want to check out the Lincoln Highway Mural, 1412 W. Rock Falls Road, presented by the Illinois Lincoln Highway Association, commemorating the historic road. Selmi’s Greenhouse, a fifth-generation, family-run business at 1206 Dixon Road, has pumpkins, cider and apples, and on weekends through Oct. 31, a corn maze, horse-drawn wagon rides and a haunted house. North to south, mile after mile, the flow of the river mimics the flow of life – in nature and in the communities along its banks. This fall season, why not follow and see where it takes you? This entry was posted on Friday, October 14th, 2011 at 11:59 am	and is filed under Features, Top Posts. You can follow any responses to this entry through the RSS 2.0 feed. Both comments and pings are currently closed.